Hair in the “wrong” place can radically affects a woman’s perception of herself and confidence in her femininity. Contrary to men, stubble and/or a 5 o’clock shadow is not a self-esteem boost but, instead, a source of discouragement. But it is possible to find that confidence back with laser hair reduction which we feel is important given there is a huge hidden emotional cost to women when it comes to unwanted hair. It can impact your work, in social situations, and can even cause you to withdraw from your intimate relationships. 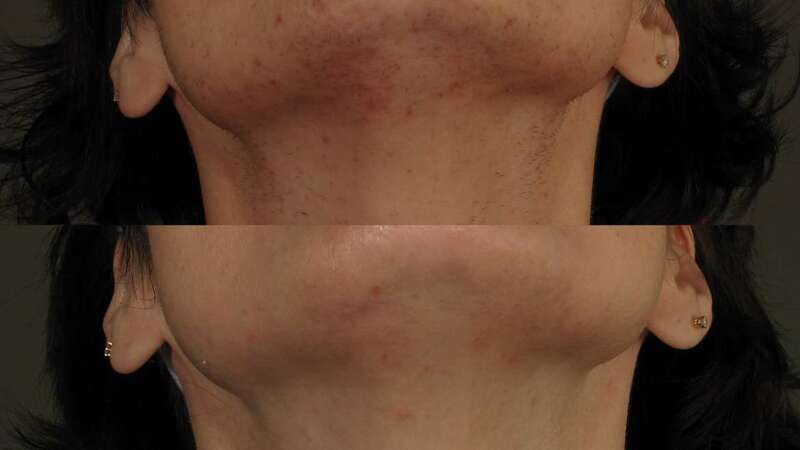 The pictures below reflect what’s possible with laser hair reduction using Sciton’s BBL. Because our hair grows in three different cycles the treatment pattern required is one treatment every six weeks for a total of five treatments. If you do the math, you’ll know that once you get started with the first treatment it will be about 6 months later when the series is finished; so planning ahead is advised. This treatment is doable year round but less “sun exposure sensitive” when done over the cooler months of the year when a person is not outside and heavily exposed to ultraviolet light. The reason fall & winter are optimal times is because the technology to find the hair follicle and destroy it is based on color in the hair shaft—it must be dark. White, gray, blonde or light red hair will not be found. If this is something you’ve been dealing with, you can overcome and also experience the radical change shown below. It is possible to get rid of the stubble and 5 o’clock shadow, and most importantly, regain your confidence! Call the office and Kim will set up your no-pressure consultation! Oh! And remember—this is a great idea for a Christmas gift! !